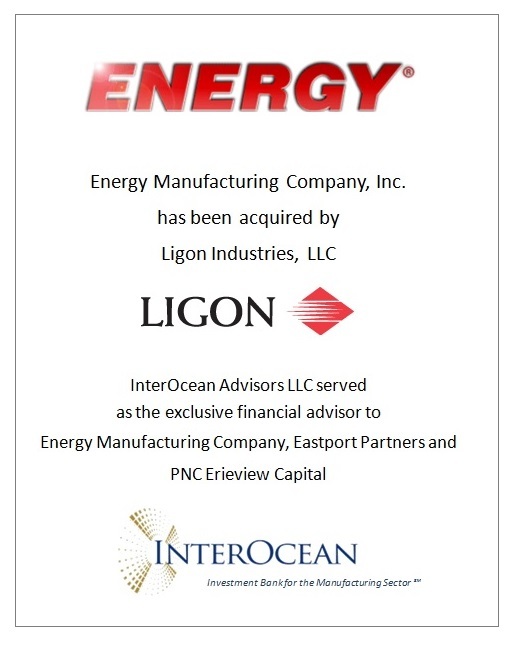 InterOcean Advisors LLC is pleased to announce the successful sale of Energy Manufacturing Company, Inc. (“Energy Mfg.”), a leading designer and manufacturer of hydraulic cylinders and related products for mobile and stationary industrial equipment, to Ligon Industries, LLC (“Ligon”). Energy Mfg. was owned by PNC Erieview Capital (“PNC Erieview”) and Eastport Operating Partners (“Eastport Partners”). Ligon is the largest independent manufacturer of hydraulic cylinders in North America through its operating businesses including HDM Hydraulics, HTI, Ramrod Industries, Seabee Corporation, Fisher Hydraulics, Great Bend Industries, Hydratech and now Energy Mfg. Founded in 1944, Energy Mfg. is a leading designer and manufacturer of hydraulic cylinders and valves. The Company’s products include engineered hydraulic cylinders, tie rod cylinders, hydraulic valves and other related products sold to customers in a wide variety of industries including agriculture, construction, lawn & garden, refuse compaction, forestry and medical. Sales of custom hydraulic cylinders to mobile equipment manufacturers represent 75% of the Company’s annual sales. The balance of sales are to stationary equipment manufacturers, other equipment suppliers and distributors. Energy Mfg. is based in Monticello, Iowa. The Company has access to Asian sourcing of cylinders through an exclusive manufacturing relationship in Dongguan, China. PNC Erieview Capital (formerly National City Equity Partners) is a Cleveland, Ohio-based investment firm. With roots dating back to 1979, PNC Erieview Capital has actively invested junior capital in over 160 middle market transactions alongside successful private equity sponsors. Eastport Operating Partners is a New York-based investment fund formed to purchase privately held basic industries companies in the United States. Ligon Industries, LLC along with its affiliates Ligon Capital, LLC and Ligon Holdings, LLC (“Ligon”) is a Birmingham, Alabama based privately owned manufacturing company consisting of fourteen independent companies. Since its inception, Ligon has consistently grown by internal investments and acquisitions. Today Ligon is the largest independent manufacturer of hydraulic cylinders in North America, is a significant supplier of high definition aluminum castings, and is a major Southeastern manufacturer of aluminum products for the wastewater treatment and commercial construction industries.